Tanzania Safari Lodge Linda Willms, a resident of Tanzania, East Africa, purchased a property at Karatu, near the Ngorongoro crater and the Serengeti. The site crests a hill and has 360 degree views including the rift valley and the slopes of Ngorongoro. Karl, his brother Jim, and Dai Ona travelled to the site in 2011 to investigate building logistics and materials availability. It is hoped that the timbers will be supplied and milled by Daizen joinery and container-shipped to Tanzania. It is anticipated that local labour will be involved and foundations and walls will be rammed earth brick, manufactured on site. 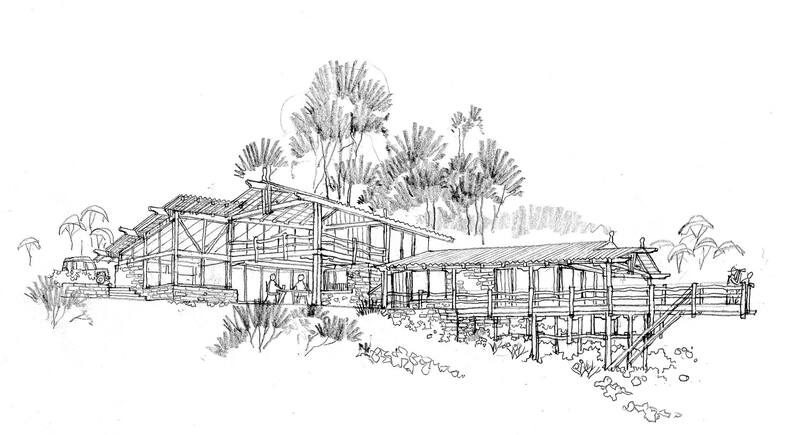 The construction of the lodge depicted in this sketch is tentatively scheduled for early 2013.